1. Indoors or Out? Choose whether you want your portraits indoors (in your home or in a photo studio) or outdoors. The current trend is to create family portraits outdoors in a natural setting, so we’ll start there. Fall is a great time of year to be outside and it tends to relax fussy little ones. 2. Pets or no pets? Many families love including their pets – after all, aren’t they family, too? If you opt to include them, make sure they will be bathed or groomed in advance of the big event and that you choose a location without too many distractions. 3. Time of day? Think very carefully about nap times, meal times and bed times if you have small children. Assuming a hungry, tired child is going to sit and smile for an hour just because it’s a convenient time for the rest of the family is a little unrealistic. Additionally, consider the outdoor light. Late afternoon or early evening light will always be more comfortable and more flattering. Your photographer should advise you on this but just in case you’re attempting a DIY family portrait, now you know. 4. Where? The typical backyard is not pretty enough or shady enough for a nice family portrait, but if you’ve got lots of open shade and grass, you’re all set. Most families hunt for a scenic spot they’d like to see displayed over the mantle. Just be careful your background doesn’t overwhelm your subjects – you want the viewer to notice your faces first, and mother nature second. 5. What to Wear? The days of “everyone wears matching outfits” are fast disappearing. 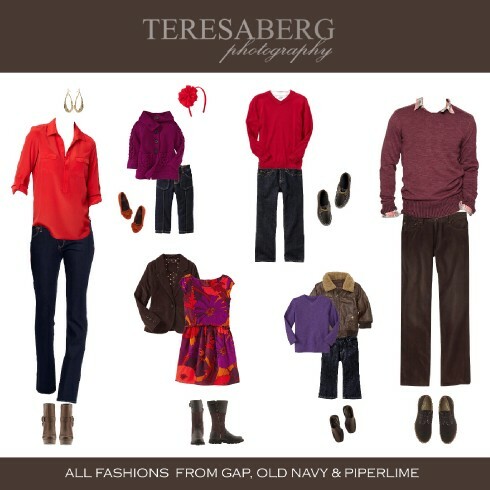 Families today are wearing complementary colors, dressing in layers and playing with texture. It’s not that difficult – just pick 2 or 3 shades of any color that looks good with your hair color and dress everyone in those shades with one or two pops of an accent color like a belt or a sweater. Go easy on the jewelry and you’re all set. Remember if you’ll be sitting on the ground you don’t want super short skirts on the girls, and grass stains don’t look great on light colored pants. Avoid the default “white shirts with jeans” – light colors not only add weight, but often show every wrinkle and stain. If you just can’t manage anything but one color, choose a dark one. 6. Posed or Casual? Everyone says they want natural, unposed portraits and then they stand still in front of the camera and smile. If casual is what you want, then relax and play in front of the camera. Have a silly joke or a game in mind to amuse the kids while the camera is clicking away. You can run or jump or even throw one of the little ones up in the air and make some magic! 7. Setting the Stage. This should be at the top of the list, but you have to make some of the other decisions first, so we listed it as number 7. This needs to be fun for your family. If Mom is stressing out and Dad is grumbling under his breath about “do we have to?” or “are we done yet?” you’re setting yourself up to fail. Make this a fun family activity. Give the kids a role in either choosing their outfits, the location or the theme so that everyone is invested in the outcome. Start planning and sharing your excitement a few weeks ahead of time so you can really sell it to the whole family. Make time during the session to take some silly shots that the that gets everyone laughing and that the kids can get excited about (even if they don’t ever hang on the wall). Then don’t forget to reward everyone with a special treat afterwards -- it will pay off with increased enthusiasm and some great smiles for next year.